Does My Horse Have Colic? 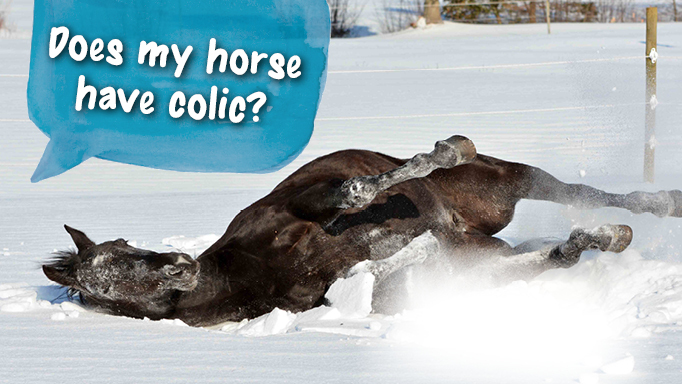 As winter sets in, changes in feed and water-freezing temperatures can create the ideal conditions for colic. Colic is pain in the abdominal cavity. In general, it involves the horse’s gastrointestinal tract, but problems in the kidneys or reproductive tract can also cause colic-like signs. Colic is common in horses due to their unique anatomy and physiology, although certain breeds can be more inclined to experience different types of colic. Mares in the last stage of gestation are especially vulnerable to colic. They can develop uterine torsion (when the uterus twists around itself and causes severe colic symptoms), and in these cases, it can be difficult to save both mare and foal. The two-week period after giving birth can also be a risky time for a mare. After foaling, the mother’s gastrointestinal (GI) tract has to adapt to having more space and the different way that food travels through the GI tract, putting the mare at risk of displacement. While the signs of colic may vary from horse to horse, the disease’s classic clinical signs include a disinterest in eating and drinking, pawing and sweating in patches. A horse that is experiencing colic may also look at its flank and want to roll. Colic can be generally classified into two types: medical and surgical. A medical colic is one that can be resolved by itself or through medical treatment, such as a mild impaction colic or gas colic. Light exercise such as hand walking can often help to resolve these types of colic by stimulating gastrointestinal movement. A surgical colic refers to an organ displacement, a torsion (twist) or an obstruction in the gastrointestinal tract – all of which cause severe pain in the patient. If the pain can’t be managed with medication and the horse’s condition rapidly deteriorates, the veterinarian will determine that the colic can only be resolved through surgery. Closely monitoring a horse and measuring its vital signs can help owners determine if something is wrong with their animal. An increased heart rate and an elevated temperature are both signs that the horse is in some type of distress. But when in doubt, calling your veterinarian is recommended. With colic, the rule of thumb is that the sooner a veterinarian can assess the horse’s condition, the better. During a field service visit, the veterinarian must first determine whether colic is actually the problem. The first step is to perform a physical examination, which includes a rectal exam and the insertion of a nasogastric tube through the horse’s nose and into its stomach to remove excess fluid. During the rectal examination, the veterinarian may feel a dry, hard mass of feed content – pointing to impaction colic. If the equipment is available, the field service clinician may also want to perform an ultrasound examination to check specific areas of the horse’s abdomen. Once the physical exam is completed, the veterinarian will generally know what kind of colic the horse is suffering from, and whether treatment in the field is sufficient or if the horse needs further treatment at a veterinary referral centre. While it can be difficult to load a horse that is in pain and wants to roll, the veterinarian can give the patient a combination of sedatives and pain killing drugs that can help to stabilize the animal long enough for it to be transported by trailer. Once the horse arrives at the referral centre, the clinical team usually conducts another physical examination that includes a rectal exam since the loading process and transport can be enough to change the horse’s condition. Next, a veterinarian will perform a blood test to check electrolyte levels and how well the horse is perfused (whether there is adequate blood supply to organs and tissues). Additionally, another ultrasound examination may help the veterinarian to further assess the horse’s gastrointestinal changes. Cases of medical colic can be treated in a variety of ways, but the main thing is to control the pain with analgesic (painkilling) drugs and anti-inflammatory medication. Colic pain can alter gut motility and cause the horse to make sudden, involuntary reactions or movements, which can result in injury. The other key issue is to ensure that the horse doesn’t get dehydrated, which can occur very quickly. Rehydration can be performed orally through a nasogastric tube that gives the horse fluids or water with electrolytes. If the dehydration becomes worse, the horse may also be given fluids into the vein; in some cases, the clinicians can give the patient fluid orally and intravenously at the same time. Very mild dehydration doesn’t require this measure, but especially in cases of impaction colic, the doubling of fluids can help to resolve the colic issue more quickly. Typically, a veterinarian will keep the horse on fluids until it’s rehydrated or the colic is resolved. In cases of surgical colic, the veterinary team will conduct a procedure known as an exploratory laparotomy during which the horse is put under general anesthesia. The surgical specialist opens the patient’s abdomen and thoroughly assesses all structures found in the abdominal cavity to determine what’s causing the pain. If possible, the surgeon will resolve the cause of colic. The type of surgical treatment depends on the type of colic. Once the incision is closed, the horse can recover from the general anesthesia. The post-surgical treatments vary case by case, but usually, the initial diet consists of slowly feeding the horse small amounts of grass or hay and giving it access to water. Does weather play a role? Unfortunately, colic can strike at any time and has many risk factors. Each season, horses have access to different feed and hay types. While changing seasons don’t usually affect horses that are stabled year round, horses that are kept on pasture are at a higher risk of developing season-related colic since abrupt changes in diet and the moisture level of the diet can increase the likelihood of a horse developing the condition. Changes in diet will change fermentation in the horse’s large intestine. The population of organisms in the large intestine that are needed for proper digestion will mirror the food that is presented to them, but this adaptation takes time. That’s why gradual diet changes (over at least five to seven days) are always advisable for horses. During the spring, horses make the transition from an all-hay winter diet to a spring diet that includes highly fermentable green grass. The richer grass diet can change the level of gas in the gut and cause gas colic. Another tricky time is during the transition between the fall and winter months when the horse’s diet has less moisture and the source of water may freeze over, leaving the horse with little to no water. Horses are also less inclined to drink water if it’s too cold, so owners should consider investing in a heated watering bowl or tank heater to keep the water at the ideal temperature of about 10°C (in the range of seven to 18°C). While snow was once considered to be an adequate watering method, veterinarians don’t recommend it since horses are usually not able to eat enough snow to cover their requirements, leading to dehydration and eventually impaction colic. Some horses that are acclimated to winter weather conditions can meet their water requirements from snow. However, there are health risks associated with snow consumption including the length of adjustment period as horses learn to ingest snow, the actual water content of the snow and local water intake. Some wild horses can obtain their water needs from snow, but the risk of colic and reduced feed intake is significant for domestic horses. Horses drink more when the water is warmed above freezing during cold weather. Regular salt intake will also stimulate horses to drink more. For an adult horse, normal salt intake should be about one to two ounces of salt per day. Additionally, make sure your horses have adequate shelter and access to feed and water throughout the winter, especially during stormy weather. Waterers should be cleaned regularly, and clean, fresh water should always be available. Water heaters should be carefully inspected for worn wires or other damage, plus the water should be checked for electrical sensations or shocks. During winter, inactivity can be a colic risk factor. Horses should be provided with regular turnout unless the weather is very bad. While turning out horses to snow-covered pastures can keep them moving, frozen pasture grass shouldn’t be used as their primary feed source. Horses usually don’t like eating frozen grass, and they may not eat enough to meet their nutritional needs. Spreading their hay out across the snow-covered pasture can keep your horses moving, plus it ensures that they get enough to eat on a daily basis. When weather conditions are so bad that the horses are barely moving, ensuring adequate water intake by having the heated water source next to the feeding area will help to prevent impaction colic. Proper management is key to preventing colic in horses. Owners can decrease the likelihood of colic by making gradual changes in feed and having fresh water available throughout the year. Scheduling regular health and teeth examinations and maintaining a deworming program are also good strategies for preventing colic. Equine researchers are working on how to prevent colic and how to diagnose it accurately so that the patient’s outcome is the best one possible. In addition, scientists are trying to develop better non-surgical treatment strategies since general anesthesia is very difficult on horses. The main issue that veterinarians struggle with is determining if, and when, an equine colic patient needs to go to surgery. Veterinarians are quite adept at assessing colic, but it’s difficult to predict whether medical treatment will be enough to resolve the issue or whether surgery is needed. For a veterinarian, it is very challenging to make that decision: the longer you wait, the higher the risks are for the patient and the less chance of a positive outcome. For the owner, there is also a higher financial cost associated with surgical treatment. It’s a dilemma that all veterinarians must face, but over time, our hope is that continued research will help to provide veterinarians with more diagnostic and treatment knowledge that they can use with their colic patients. As a practitioner, I also find that being involved with numerous cases of colic is essential to my training. I learn something new from every case of colic. No veterinarian wants any horse to suffer from colic, but the reality is that every colic case helps to better equip equine practitioners with more tools and experience that will allow us to make quicker and more informed decisions in the future. 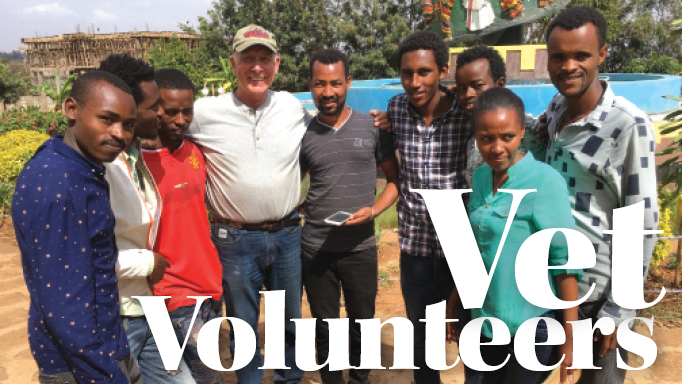 Creating better lives for working equines abroad. 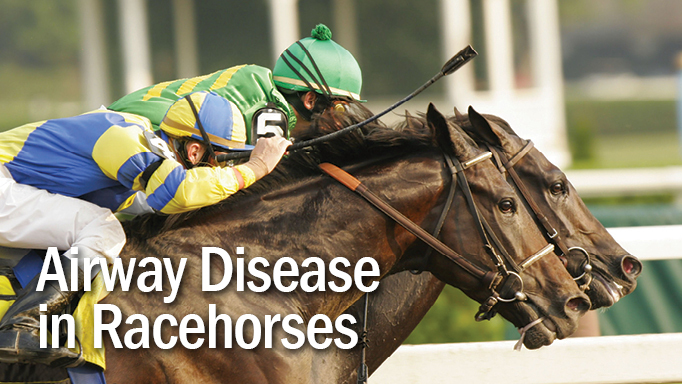 Inflammatory Airway Disease robs racehorses of their breath, and, therefore, their stamina. 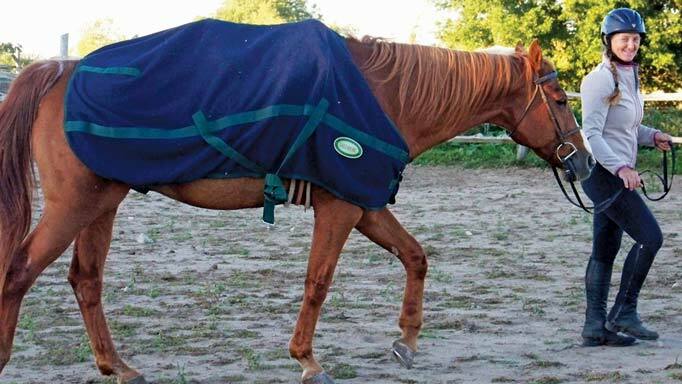 Anne Gage shares tips for giving your horse a proper cool down after exercise.